The centralized administrator control dashboard provides a single-page view of the complete system, including: user counts broken down by user types, storage quota, disk usage, license information, and system version. The dashboard also monitors pending updates, latest files and users added to FileCloud. FileCloud’s easy snapshot view of the storage quota and disk usage helps administrators keep the system up and running with zero disruption. The storage quota is broken down into Allocated Quota, Used Quota and Remaining Quota. In addition, the information on disk usage, log folder size, and available log space provides insight into the back end of the system. FileCloud’s license section summarizes licenses and their expiration dates. One click takes you to a page from which you can update the system with new licenses. The system version and update section also lets you know if there are any pending updates to FileCloud. This allows you not only to be informed of any pending updates, but also download all new updates with one click. FileCloud offers an array of advanced user management features to manage user devices, files, file shares and endpoint security policies. FileCloud provides detailed inventory of connected devices (PCs, Smartphones and Tablets) for every user. In case of an emergency, FileCloud Administrators can block, remote wipe or send messages to connected devices. By controlling and protecting the data stored on endpoint devices, FileCloud can reduce support costs and business risks. With FileCloud, admins can copy or move files from one user to another user. This feature is especially useful when admins must move a set of files from one employee to another (change of job, promotion, sabbatical, vacation). FileCloud administrators can change permissions or remove file share settings created by users. This feature helps control data leak situations in which a user knowingly or unknowingly shares confidential files to external parties. FileCloud provides an array of customization options to broadcast and popularize organization brand. 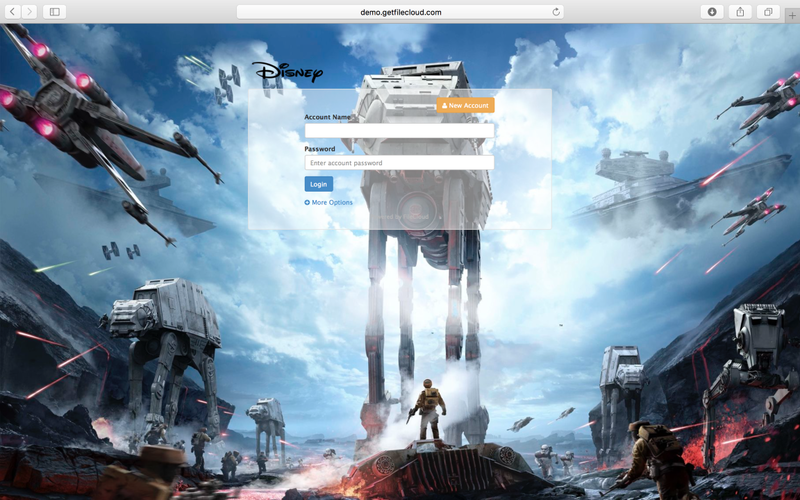 The FileCloud login page can be customized to reflect organization brand by using a background image and company logo. You can also customize email templates to reflect organization brand. FileCloud can be run on business domains (Ex: files.yourdomain.com) using the company’s SMTP server for FileCloud transaction emails. Share URLs originating with your domain assure users that files are from a trusted source and reduce spoofing and ransomware attacks. FileCloud admins can replace FileCloud’s TOS with organization Terms of Service (TOS). Custom newsfeed can broadcast important announcements to users. When the same group of users needs access to a plethora of applications, creating custom authentication for each application ruins end user experience and makes it nearly impossible for system administrators to maintain varied authentication lists. FileCloud can easily integrate with existing authentication systems within an enterprise. FileCloud can be easily integrated with OKTA. In this setup, OKTA acts as the identity provider and FileCloud as the service provider. FileCloud can be set up so users can use their ADFS credentials to access FileCloud. 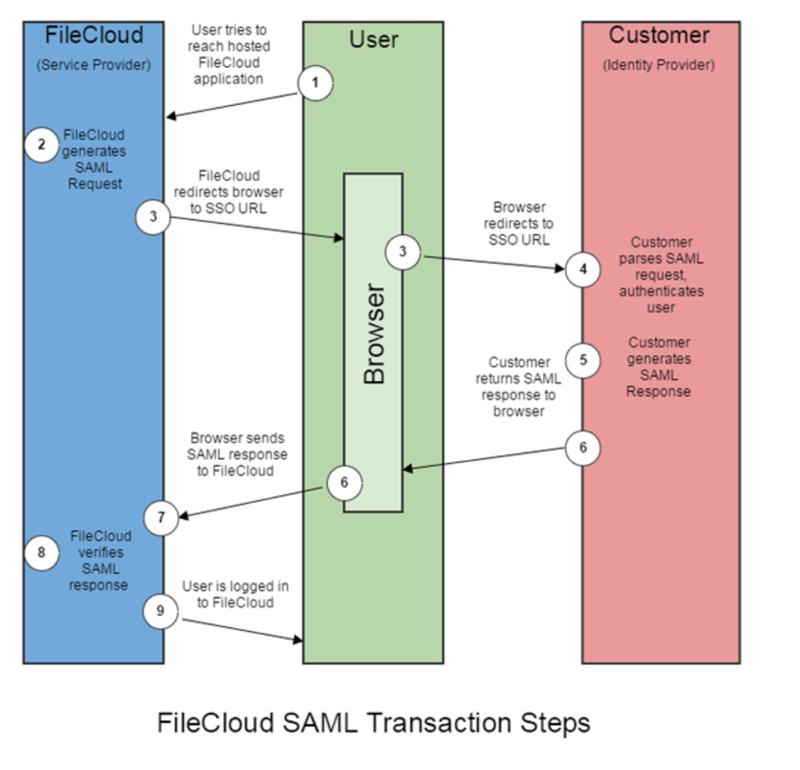 In this setup, from a SAML standpoint, FileCloud acts as a service provider and as a claims-aware application. FileCloud can be set up so users are automatically logged into FileCloud by enabling domain user SSO login. FileCloud provides a rich suite of tools to establish, enforce and track user policies. To make FileCloud access even more secure, FileCloud can be configured for Two Factor Authentication (2FA). The 2FA can be enabled globally for all users and can be overridden per user. The 2FA codes are sent via email or you can use mobile apps like Google Authenticator. FileCloud’s 2FA is not only available for users, but also available for FileCloud administrator and super administrator. FileCloud system administrators can control whether users invite new users when creating file shares. Administrators can enforce strong user passwords and specify number of incorrect login attempts, account lockout time period, and automatic logout during lengthy inactive user sessions. FileCloud system administrators can configure and control mobile application behavior for users. Under the current set of configurations, administrators can require passcode lock for mobile clients and disable mobile clients from connecting. Users can also edit, print, download, open, and share documents via mobile. FileCloud’s audit reports assist system administrators of any size IT enterprise to understand usage and monitor user behavior. The reports and filtering tools can be easily accessed via the centralized administrator dashboard. From the administrator dashboard, system administrators can view the complete list of shares created by users and locked files and folders. The User Shares Report includes information such as user name, location, expiration and share type (private or public). The User Locks Report provides a list of files locked by users. FileCloud provides a quick view of the latest files and users added. This helps administrators monitor usage and be aware of their growing user base. FileCloud monitors all user logins and activities including deletion, uploads and downloads. In addition, FileCloud provides tools to filter activities using date range, user names and text search. With FileCloud, enterprises need not buy any additional device management software. FileCloud comes with a device management feature that allows system administrators to deny access and send messages to any device/client application accessing FileCloud. From FileCloud’s administrator dashboard, system administrators can view the list of devices accessing FileCloud. Any device can be blocked from access by setting the permissions appropriately. The remote wipe feature enables administrators to delete sensitive data from a lost device or from an ex-employee’s device. With device management covered, FileCloud provides a way for administrators to block a client application accessing FileCloud. The client applications that can be controlled include FileCloud Drive and FileCloud Sync. The device summary report provides a list of user names, access device names, device details, last login from device, and any pending action to permissions. As with other reports generated by FileCloud, the report includes a filtering tool. FileCloud is the first enterprise file sharing and sync platform to support GDPR across private, hybrid and public clouds! Enables administrators to discover and manage sensitive data. DPOs and administrators can easily search for common data types using built-in pattern identifiers including e-mail addresses, and phone numbers. In addition to common patterns, there are built-in templates to search for complex patterns. FileCloud allows an organization’s data protection officer (DPO) or administrator to search for user PII (Personal Identifiable Information) across all file content and activity logs. Users can demand companies to delete or anonymize any information that they have on them. Admin can delete or anonymize access /activity logs, discover and delete files and comments. Has your FileCloud user-base increased and become difficult to manage? No problem. Just create new administrators to help manage users. To create a new administrator simply move a user to the Admin list.